3 - Pages of fine tracing paper. 1 - Deodorant stick (to help trace your design to your body). 1 - Black ink pen. Genipa Americana is the botanical name for jagua – an edible fruit that grows naturally in the Amazon jungle. The fruit exhibits many properties, one of which is the ability to temporary dye the skin with a blue-black color and this is what makes it a perfect ingredient in the manufacture of tattoo gels and inks. The native of South America have used the fruit for centuries in making different body adornments and also for medicinal purposes. 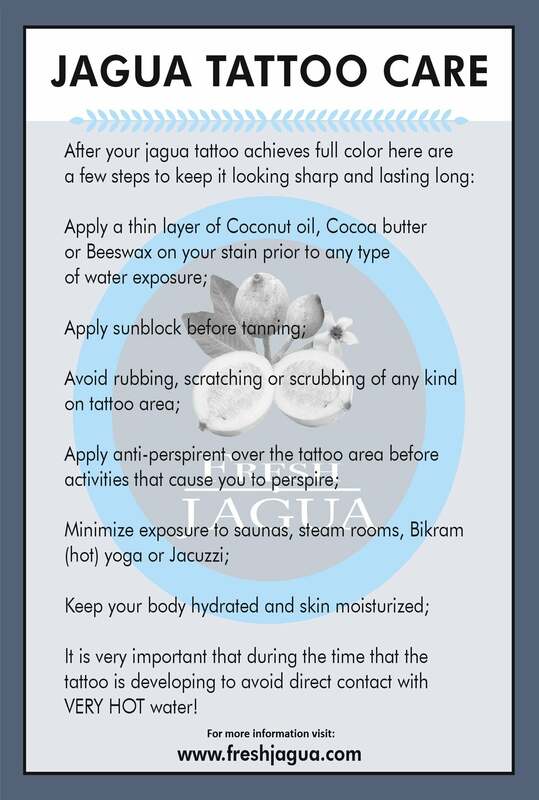 Jagua gels are thus 100% natural and safe. Most of the items used in manufacturing the gels and inks are all food ingredients and can also be used for creating body art for children in the family. With 1 Oz. Jagua Tattoo Gel Combo Kit, you get a ready to use gel that requires no mixing and ships directly from the manufacturer. You will also be happy to learn that 1 Oz. Jagua Tattoo Gel Combo Kit doesn’t have any PPD or other toxic materials for that matter. 1 Oz. Jagua Tattoo Gel Combo Kit has been designed to last for up to fourteen days.